Category Archives: Ruben Amaro Sr.
Additional Information: Seeded in packs of 2012 Topps Heritage. For the fifth straight year, Topps included buybacks of the cards whose design was replicated in its Heritage set. As with every other previous year, Topps desecrated the vintage original by applying on its front a “50th Anniversary” foil stamp that bears the year the card was originally issued and the year it was seeded in packs of Heritage. The checklist below does not list the variations that appeared in the original 1963 Topps set, as it is unlikely that Topps procured any of the rarer variations for inclusion into this insert set. 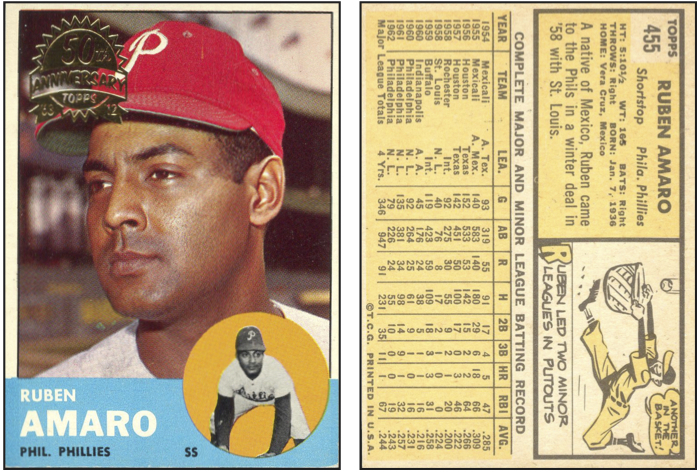 Posted in Phillies Database Project, Ruben Amaro Sr.